Creating yarn pictures is a simple exploration of abstract art and a fine motor exercise. It is also good practice using glue! Included is a book recommendation that fits perfectly with the creative art project. Yarn pictrures can be completed indoors or out. If you have a beautiful day outside, take your supplies outdoors. Sit in the driveway or on the grass to create! 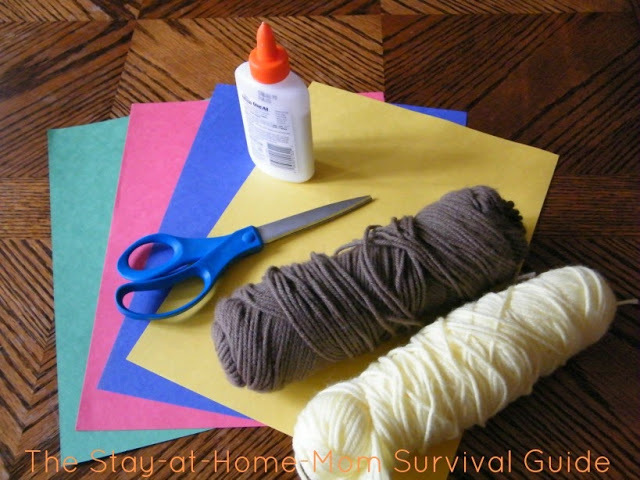 The directions are simple, your child creates on their paper by drawing with the glue then placing yarn along the glue lines. When the kids said they were finished, I asked them to tell me about what they created. When I was teaching I always asked children to tell me about their art so I could write their description on their paper. This extends any art activity to include literacy and print awareness. My kindergartner told me his yarn picture was “the tops of the trees”. My toddler did not have an answer. That is ok! It was fun watching them create. Don’t be afraid to make your own yarn picture along with the kids! A young girl’s imagination makes her create fun pictures in her mind all with one small red squiggle. It looks just like a piece of yarn. This is a great book to read if your child is having trouble thinking of something to create with their yarn. 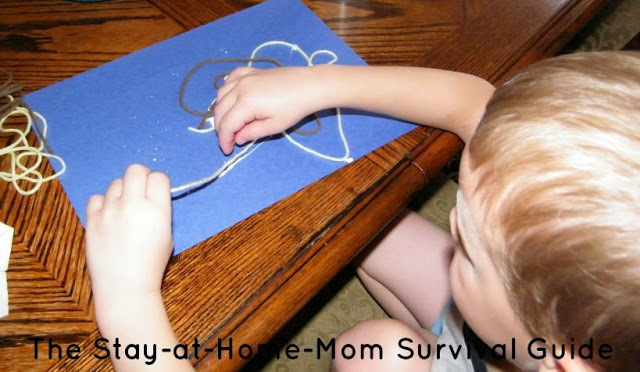 They will get some ideas of what they can create with their own squiggle of glue and yarn. I am glad you stopped by. Give these yarn pictures a try whether you have a 2 year old or a 10 year old. Scroll down to view all the blogs participating in this 100 Days of Play series. You will have a lot of fun kids activity inspiration. I love this idea for the bigger kids! We have tons of colorful yarn in the house – I feel a challenge of who can make the most interesting picture coming on… thanks for the idea! Ooh!! That sounds like a plan! I hope it goes (or went) well. Have fun! Thanks so much, Natasha. Share away-the more moms (and dads) we reach the better! Take care! I remember doing this when I was little! What a fun way to create! I am sure most people would have all of the supplies on hand, which makes it even better! Thanks for sharing in our 100 Days of Play! I have linked and shared your post in our blog hop! Thank you, Rachel for all of your organization on this blog hop. I am happy to have had the opportunity to participate and have the idea shared! I am so glad that it will reach many moms. Thanks for all you do! We did this on Tuesday by accident. I was pulling out paper and stickers when I saw the wool. The kids loved it and everyone thats seen them on the fridge has commented. lol. Thanks for sharing your great ideas. Thank you for sharing your thoughts! I am glad to hear that it was a great activity in your home. All the best!